YouTube has launched the first of what appears to be the beginning in a series of interactive Q&A forums for the YouTuberati called Living Legends. What better way to heighten their product’s awareness while bringing attention to the scale and reach of YouTube? What other video platform can distribute brand messaging globally as quickly and effectively? And what better way to kick things off than other than through a joint venture with the world’s greatest Rock N’ Roll Brand: The Rolling Stones? 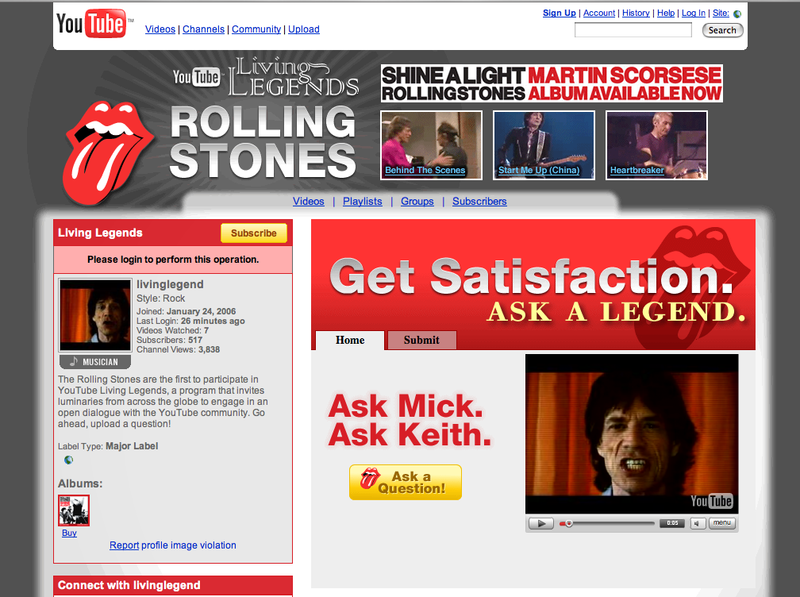 This entry was posted on April 4, 2008 at 11:00 am and is filed under Living Legends, Rock N' Roll Brand, Rolling Stones, YouTube, YouTuberati. You can follow any responses to this entry through the RSS 2.0 feed. You can leave a response, or trackback from your own site.